An acne kit does not always include a bunch of different products just to clear your skin. 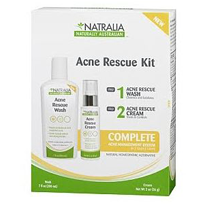 The Natralia Acne Rescue Kit is only two products, hardly a giant commitment. The Acne Rescue Kit includes a face wash and a treatment cream both designed to treat existing acne and to prevent pimples. Does this two-part system have what it takes to clear up your skin? We need to take a closer look at the ingredients to find out. A lot of people tend to combine acne products to create their own treatment, but the Acne Rescue Kit gives you a convenient kit that should help you with all kinds of acne problems.The Acne Rescue Wash is used first in the kit. The wash cleanses the skin from any impurities ranging from bacteria to makeup. 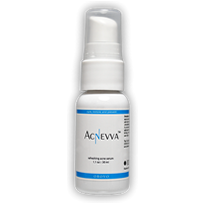 The homeopathic blend of ingredients gently exfoliates the skin without aggravating acne. Some of the ingredients include witch hazel as an antiseptic, calendula extract to reduce redness, and lavender to soothe the skin.After the skin is clean, you can use the Acne Rescue Cream to treat acne-prone skin. 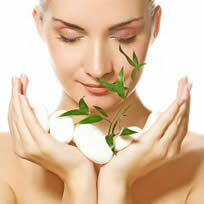 The cream is a spot treatment that melts into your skin. The formula contains tea tree oil to penetrate the skin in order to kill bacteria as well as rose hip to help balance skin tone from acne scarring. The use of tea tree oil is a great natural substitute for the acne medication benzoyl peroxide.The natural formulas in the Acne Rescue Kit help address acne without side effects. Without using salicylic acid or benzoyl peroxide, the kit doesn’t run the risk of skin irritation, redness, or peeling. 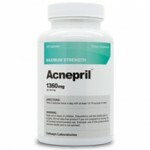 At first glance, the kit seems to be a simple and effective way to treat acne. However, there are customer complaints that suggest the Natralia Acne Rescue kit may make the skin worse before it begins to get better. If you have patience the kit could be beneficial, but there are alternative treatments that do not make you suffer before you find relief.